Despite interventions by the United Nations Children’s Fund (UNICEF), access to safe water and adequate sanitation in Nigeria, eludes several communities, a situation that will demand collaboration among governments, the private sector and communities writes CHIOMA UMEHA who just returned from Bangai in Riyom Local Government Area of Plateau. “At 12, Sarah Danjuma’s dream was to become a doctor. She once told me she would help poor villagers who could not afford treatment. 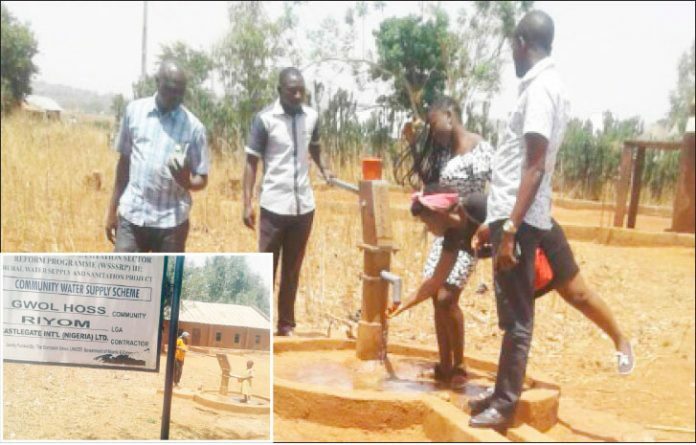 Think of the irony, we lost her due to lack of access to safe drinking water and poor hygiene,” said Mrs. Victoria Gyang, Head Teacher, Community Primary School, Bangai Local Education Area in Plateau State in a chat with DAILY INDEPENDENT. The strains, crisis and tragedies of lack of access to safe water, adequate sanitation and hygiene facilities in Bangai sounded like a bad storyline when Gyang spoke to DAILY INDEPENDENT. She said, “We often had emergencies as children were often coming down with waterborne disease such as cholera, diarrhoea, among others. The Head Teacher, while grieving over the effects of the galling problem of poor water and sanitation, stressed that the situation was worsened by growing insecurity, especially among children. She said, “But there is also a big challenge that we face here: daily we keep having children drop out of school owing to one issue or the other, one of which is security, because of the many crisis we have experienced in this community in the past 15 years. “Most of the children are orphans and when there is nobody to sponsor them in school again they drop out; and they really need help because they all have potential to be somebody in the future. She added, “Most of the children in this school stay with their relations, while some even live with strangers. “You know if a child is not your own, the passion to really take care of such child will not be there. Investigations show that both adult and children in many of the low and middle-income communities in Plateau State indulge in the revolting practice of open defecation and general poor hygiene until recently. Many people in Riyom LGA were still unschooled in basic hygiene practice when young Elizabeth, a 10-year-old pupil of Bangai Primary School, suffered from typhoid infection. According to Gyang, “Elizabeth survived severe abdominal pain, with liver and spleen enlargement that she gave up schooling. Elizabeth, like many other children in Bangai, hardly has access to safe drinking water, hygienic toilet and soap. Even when they have access to clean water and soap, many children simply forget to wash their hands, despite regular demonstrations and monitoring. “Water used to be so dirty and unsafe in many places in this area,” said Gyang. Drinking of impure water can cause waterborne diseases that could be harmful to the health. Some of the diseases caused by polluted water are cholera, diarrhea, typhoid, dysentery, lead poisoning, polio, malaria, cancer, hepatitis and food poisoning. However, all these have changed in Bangai with intervention of the European Union (EU) funded UNICEF programme. The EU and UNICEF project did not only provide boreholes for the villagers and the school, but has also built a modern toilet for the school. So far, the facilities have started to improve hand-washing compliance as well as water and sanitation standards in the school. The pupils, in turn, have become change agents, as they spread the good news to their parents, educating them of the benefits accruable from such practice. Explaining measures which are taken to ensure that all pupils in Bangai Primary School use the toilet and do not defecate in the bush, Catherine John, Toilet/Health Prefect said, they often discipline those who defecate in the bush to serve as deterrence. As at the time DAILY INDEPENDENT visited Bangai in March, the community has embraced good hygiene. Commenting on the development, Yakubu Bwede, Bangai Community leader, said they have gradually but steadily embraced the new changes. He said the community has decided to make it mandatory for every household to provide toilet facility. According to him, “Those who do not comply with this directive, which is monitored periodically, are fined N2, 000 as penalty for not doing so. “Such money collected is used to provide public toilet for the community so that everyone could be part of this life-saving intervention from UNICEF. UNICEF made this revelation as Nigeria joined other nations to mark the International World Water Day, which holds annually on March 22. The day is set aside to focus attention on the importance of safe water and for advocating for sustainable management of safe water resources. In the rural areas, according to the survey, 19 million people walk long distances to fetch unsafe water from lakes, streams and rivers. It added that diarrhea remains the leading cause of death among children under the age of five in Nigeria. UNICEF Chief of Water, Sanitation and Hygiene (WASH), Nigeria, Zaid Jurji, stressed, “Improving water and sanitation services as well as basic hygiene practices in Nigeria calls for a strong commitment from all partners – the government, the civil society, the private sector and communities. UNICEF, in collaboration with the federal, state and local governments, has provided safe water in the past five years to over eight million Nigerians living in rural areas. But, access to potable water, according to the world body, remains a challenge to the majority of Nigerians, especially those living in the rural areas. But, again, the EU/UNICEF programme in Bangai has, somewhat, solved the irritating problem of open defecation in the community. When news broke recently that Nigeria was ranked third among countries of the world where people still practise open defecation, many could not believe the report. However, given the source of the report, it was difficult to fault. Jurji gave this indication when he visited Katsina State late last year. “The situation of sanitation in Nigeria is alarming. Nigeria is third worldwide when it comes to open defecation, one-third of the population practise it,” he said. The UNICEF WASH chief said his organisation would continue to provide funds that would be merged with counterpart funds from state governments to render the much needed services. Jurji said that eradicating open defecation would also assist in improving sanitation, being one of the Sustainable Development Goals (SDGs). He stressed the need for every household to ensure installation of a standard pit latrine, at the very least. Incidentally, this is not the first time Nigeria will be occupying the top spot in open-defecation ranking among affected nations in the world. The country first occupied the top spot in an earlier ranking done in December, 2016, according to WaterAid, an Infographic international charity, focused on improving access to safe water, hygiene and sanitation. Open defecation is the practice of people excreting outside and not into a designated toilet. The term is widely used in literature dealing in water, sanitation, and hygiene issues in developing countries. Another report released by leading medical journal, Public Library of Science (PLoS) Medicine, revealed that poor sanitation and unsafe water, as well as bad hygiene, lead to the death of more than two million children annually or almost 20 per cent of all child deaths worldwide. Quoting the study, UNICEF said almost one-fifth of the world’s population still defecated in the open in 2010, with 2.6 billion people not having access to basic toilet facility. “Children are dying every day from diseases, such as diarrhea, even though we know how to prevent them,” said Clarissa Brocklehurst, chief of water and sanitation for UNICEF. UNICEF noted that diarrhea, cholera, typhoid and other diseases can easily be prevented with cheap and proven interventions such as pit latrines and hand-washing with soap. Many living in houses without identifiable toilets are compelled to defecate in open spaces, such as dumpsites and on the bank of slowly flowing streams and rivers. The evidence is everywhere. Nigeria appears to be one huge field, where people defecate, without shame, and without putting into consideration the impact of their action on the health of others. Drissa Yeo, Head, Bauchi field office, including Gombe and Plateau States and UNICEF WASH specialist, who also explained the implication of diseases such as E.coli. Yeo said: “You can easily get your food and drinking water contaminated even though it is coming from a borehole. This is where E.coli comes in. “One will say ‘I have defecated there; it is not close to my house’ but when the wind blows, there is no border. One of the biggest transporters is the fly,” he said. The health implication is that you can easily get your food or water contaminated, he stressed. “A gram of faeces it is transporting means it has left behind him about 10 million viruses. You can imagine if you swallow one of the viruses, you are already contaminated, Yeo further explained. Regretting that people are yet to understand where typhoid is coming from, Yeo said such contamination would lead to diarrhoea and typhoid, “ An individual could also get Hepatitis E and A. There is a big health implication when it comes to open defecation. Meanwhile, UNICEF has said that in order to effectively check open defecation in different parts the country, the Federal Government will need to invest about $8.3 billion. According to the joint UNICEF and the World Health Organisation (WHO) report, lack of toilets remains one of the leading causes of illness and death among children. The report said that diarrhea, a disease often associated with poor sanitary condition, and respiratory infections resulting from poor hygiene, kill over 400,000 children, under the age of five, annually. “These are largely preventable with improvements in water, sanitation and hygiene,” said Yeo.